L: 34" x W: 38" x H: 40.5"
Chex Power Rocker Recliner Debating style vs. comfort? Check off both boxes with the Chex power rocker recliner. Small details like slender, slightly flared arms and welting on the plush back and seat cushions create a more refined profile and redefine the usual recliner shape. Access the discreet push button panel for infinite reclining positions and enjoy the uninterrupted comfort of chaise-style seating. For seating that looks as good as it feels, the Chex rocker recliner is a win-win choice. Debating style vs. comfort? Check off both boxes with the Chex power rocker recliner. Small details like slender, slightly flared arms and welting on the plush back and seat cushions create a more refined profile and redefine the usual recliner shape. Access the discreet push button panel for infinite reclining positions and enjoy the uninterrupted comfort of chaise-style seating. For seating that looks as good as it feels, the Chex rocker recliner is a win-win choice. Very happy and comfortable customer! As always, we are very satisfied with the service we received at Raymour and Flanigan. The professionalism and courtesy of the sales associates, [names removed for privacy], in the Whitehall store, and the store manager are unsurpassed. This recliner is exactly as described and meets our expectations with style, color and most importantly, the comfort and ease of having power with many different options for position. Highly recommend if you are 5'8" or shorter. We put this chair in our bedroom and my husband rarely gets to use it, cause I am always in it. Very comfy! It is beautiful and the electric adjustments allow you to adjust the back and legs separately so that you can find the exact position that you want. My wife and I purchased this chair for her to feed and rock our newborn baby girl. The best part about this chair is that the back rest and the foot rest are independently adjustable. I would recommend this to anyone in the same situation. I am enjoying my Lazy Boy rocker recliner. It is comfortable and even gives me luxury of a USB hookup to charge my phone. An unexpected bonus. I am happy to say that my low back pain has lessened since I started using the chair. The in store service by Jamie M. and the delivery headed by Mike ? was excellent. the chair is most comfortable. controls are effortless. I would purchase again. try and I love my chair. Good quality, perfect cushioning and not a huge piece of furniture in my room. Very happy. We are very happy with our new chair. The electric adjustment is great and so easy. The recliner can be set in so many positions you can not help but get comfortable. The recliner is solid and you can tell it is quality and will last for many years to come. Love this chair. It is comfy for my husband at 6 ft. and myself at 5 ft. Such a nice neutral color and the fabric is soft. I also like the fact that the footrest is a connected fabric to the chair seat. I never liked all the gaps and spaces in traditional recliners. (1) If I knew it came apart, we would have put it in the back of our SUV and saved the delivery cost. (2) If I pay for delivery and set-up, then the item should be set-up and together. the fabric on my lazy boy recliner catches and has pulls and runs the weave allows this to happen after only 2 weeks of use. I posted a picture on the lazy boy site. My husbands simply loves the comfort and functionality of this chair. We were shopping at a couple of stores for a manual queen anne reclining chair, but wound up with a reclining electric powered rocker for only a bit more than we wanted to spend on the chair, but with so much more comfort and ease of use. Very satisfied with our purchase. This chair was bought for my husband. He finds it very comfortable for his back. He likes the power recline and incline for the legs. The features are very smooth working. My chex rocker is the bomb!! It is so comfortable and easily accessible to operate. Its just what I needed for my back, I am so happy and satisfied with my choice of a quality comfy chair. A terrific chair for knitting, relaxation, and certainly napping. I fell asleep twice the first day we had this chair. It is comfortable, but gives great support to my back and legs. The upholstery fabric is very attractive and the controls are easy to use. I couldn't be happier with this purchase. This recliner replaced an old one that was popping springs and creaking badly. It is motorized with 2 movements and reclines nicely. My tall husband fits nicely and the microfiber fabric is a neutral tone that goes well with our other pieces. Good choice. I knew the moment I saw it, it was the one for my husband, and also for me - we bought two - one for each of us. My reaction when it was delivered and set up in each room was, "YES!!!" It not only looks great, very classy, but most of all, very comfortable. Built in power buttons are great, and fast. Love the fabric. I look forward to coming home after work and winding down in my new recliner. We are very happy with our purchase of two recliners & a very large accent mirror to hang between them. They look classy. The material is very soft and comfy, along with their comfort level. Our sales Rep Jerelyn was knowledgeable, along with having a background in design, which was extremely helpful in our final purchase. She was very patient & helped us explore all our options. The gentleman in the credit department, along with the delivery personnel were very kind & courteous. I just got this Rocker Recliner. It is very cosy and comfortable. The polyester clothing is very soft. It is so easy to maneuver the buttons to different positions. I would highly recommend it. Love love love it. We purchased this recliner for our bedroom. It is not too big or intrusive and the color is perfect. It is super comfortable too. Great chair. Should have been tested before delivery. Now that the chair had been repaired it is great. When it was delivered the mechanism didn’t work. A repairman came out and installed a missing part. Looks good. Comfortable. Needed repairs immediately after delivery. This chair is the perfect size recliner. It does not have that appearance of a big bulky recliner. The color is lovely and the comfort is great! It's very comfortable and fits me better than some of the bigger models do. But the main thing is, it is easy to fall asleep in the chair. That's all I need. We needed a new chair for our bedroom and this chair is very cozy and very comfortable. Especially nice to nap in. Loved this chair as soon as I saw it on line ,got to the store only to really fall in love with it I had intention of changing the color and material but just loved it the way it was originally ...just have to be careful because it's so light. I have always liked Lazy Boy products and this is no exception. The Rocker Recliner is very comfortable and fits in with the rest of my decor perfectly. The manager at the Franklin Mills store was very helpful. I hope to continue to enjoy my new chair for years to come. I would definitely recommend this product to family and friends. 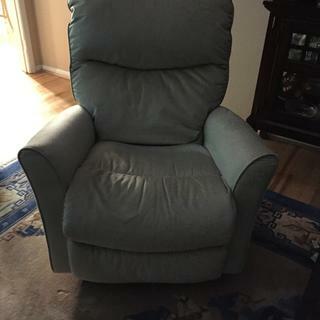 This power rocker recliner was bought in November and broke 3 weeks later and had to be replaced. It is OK to sit in if you don't put the footrest up. There is no support for the head when reclined and you need to use some sort of pillow for support. It takes a minute to get out of the chair and if there is any pressure on the footrest it will hit the floor while reclining and therefore stop reclining. The fabric is also breaking down on the inside of the arm of the chair. This is a poorly designed and crafted chair. I'm hoping for a replacement. Unfortunately, I bought 2. My advice; stay away from LayZ Boy. What company manufactures this chair? BEST ANSWER: The manufacturer is La-Z-Boy. What colors does this chair come in? BEST ANSWER: We stock the Chex Power Rocker Recliner as pictured for immediate delivery. Other fabric choices are available to special order and can be viewed exclusively through your local Raymour & Flanigan store. What color is this and what kind of material? BEST ANSWER: Hello Karen! For a complimentary sample of the upholstery, click on the "Order Swatch" link located just below the name of the merchandise on the web site. Please remember to include your complete name and mailing address. It is between a tan and cool cream color, high-grade polyester fabric, and has a beautiful shine. Easy to clean and a comfortable sleek chair - especially for a recliner. The recliner is so comfortable & the fabric is so soft. I think it’s polyester, but very soft & plush. The color is beige & one of the best recliners I’ve owned. The color is a creamy light beige, very pretty and goes well with other colors. It is a microfiber and easy to clean....six grandkids and 2 cats. Great chair! The color is soft gray & it blends with every color in your room, a comfortable chair . can the swivel be stopped ? BEST ANSWER: The Chex Power Rocker Recliner does not swivel. The chair doesn’t swivel. It rocks and reclines. BEST ANSWER: Hello Jeanine, thank you for your interest in the Chex Power Recliner! Yes, the power buttons can be placed on the left side instead of the right for an upgrade cost. Please visit your local showroom to order! It’s on the right side. Only the maker could answer if it could be placed on the left. It also has a USB port which is very handy. Can you get this in a manual version with a lever? BEST ANSWER: The Chex Recliner is only available with power recline. How much is the leather option? BEST ANSWER: Hello Karen, thank you for your interest in the Chex Power Rocker Recliner. Other fabric choices available for special order can be viewed exclusively through your local Raymour & Flanigan showroom. Our associates can provide pricing for these fabrics. I'm preparing for delivery of my recliner. Is the electrical plug the 2 prong or 3 prong type? BEST ANSWER: The electric cord is a three-prong plug. Are the electric components sealed to prevent access by my cat? Are they located in chair bottom or back? BEST ANSWER: The electrical components are sealed, and located at the center bottom of the chair. is the back of the chair removable for moving? BEST ANSWER: The Chex Power Rocker Recliner does have a removable back.